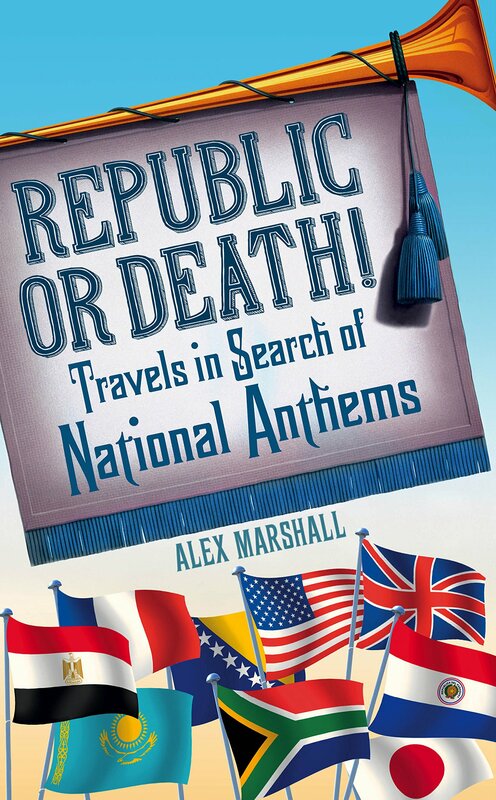 Meet the world’s newest national anthem – sort of! Yes, that is an accordion cover of Take Me Home, Country Roads. But amid the accordions, something else happened: the world’s newest national anthem was unveiled. Well, sort of. I’ll let you decide if those words are an improvement, but here they are being sung for the first time on Swiss TV. I pop up at some point, worryingly! A leading Swiss charity is now going to try and popularise the words to the point the government feels compelled to adopt them. The lyrics were written by Werner Widmer, a 62-year-old director of a medical foundation. 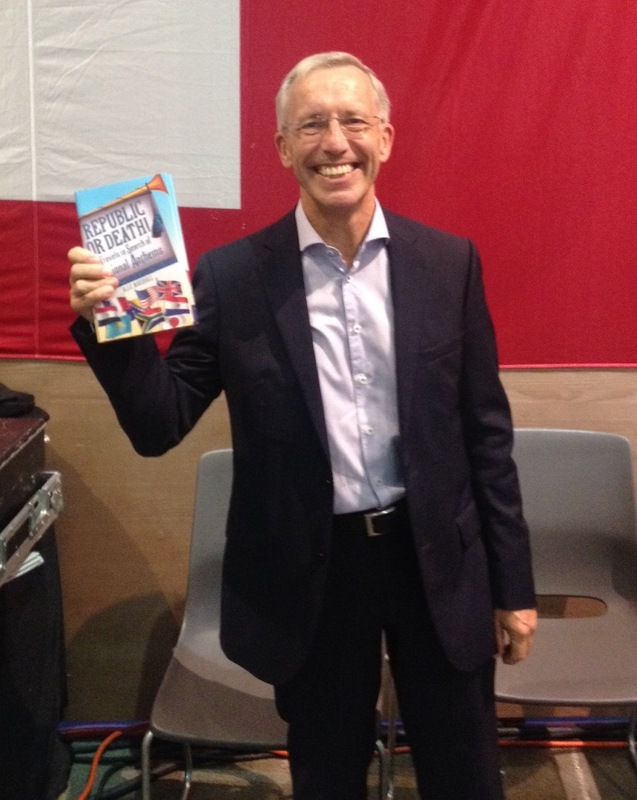 Here he is in front of a Swiss flag, holding my book! Werner seemed a really nice man. He entered the anthem contest simply because he wants to inspire people in his country to be better, he told me, before adding that he’d probably donate his 10,000 Swiss franc winnings to Syrian refugees. See, he’s really nice. Meeting him made me really want to love his anthem, but I can’t deny that I’d have preferred it if the Swiss had gone for something more daring. The song that came third was exactly that. 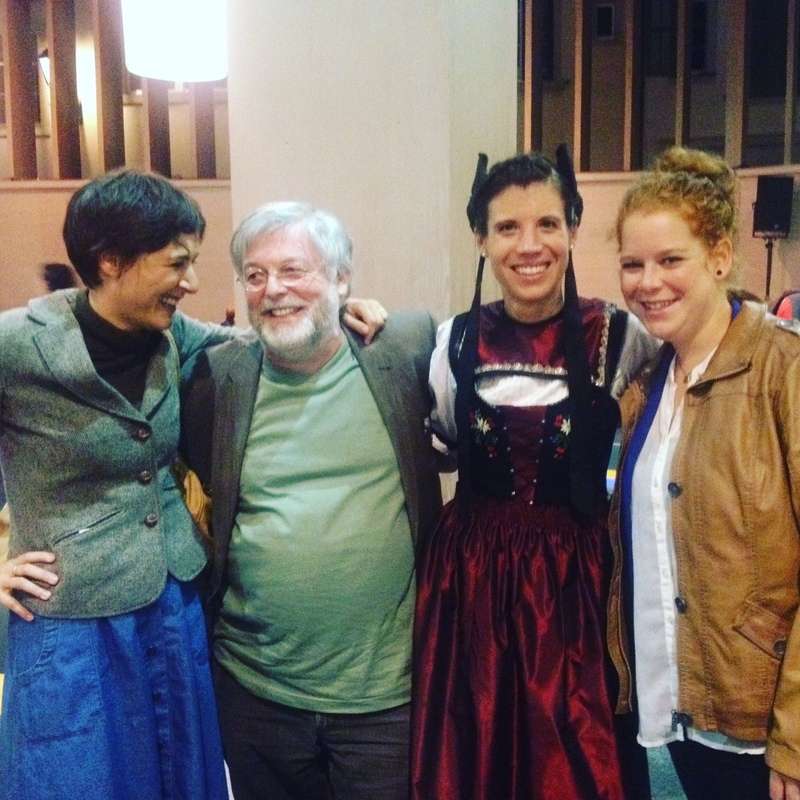 It was written by the people in the photo below, the most important being the woman in traditional dress: Kathrin Ammann Stäfa. She created a bizarre new tune that even goes into a minor chord at one point, but the more I hear it, the more I like it. Maybe next time, Switzerland! If you want to read more of me prattling on about the Swiss contest, I suggest you head to the Suddeutsche Zeitung, one of Germany’s leading papers, which quotes me a lot including calling for a drone strike to destroy all Swiss accordionists. Lesson learned: don’t send out sarcastic tweets in the middle of music festivals! Pick Switzerland’s new national anthem, so they don’t pick the one that sounds like a stalker shouting through a letterbox! 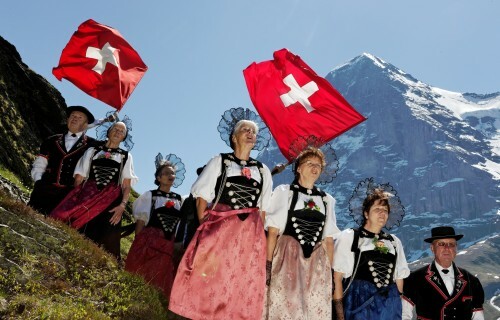 Back in 2013, Switzerland announced it was seeking a new national anthem to replace the current Swiss Psalm, which sounds too much like a “Biblical weather forecast”. I may have submitted an entry, and I may have been quickly rejected, but that isn’t a story for now! What is, is the fact they’ve just revealed the shortlist. It’s made up of six songs: four rewrites of the current lyrics and two new compositions. The phrase “un pour tous, et tous pour un” was being said all over Switzerland in 1868 as a way of uniting the country after devastating floods. It became so popular it was even carved into the roof of the Swiss parliament. It should be the perfect slogan, then, to make the centrepiece of the country’s national anthem, as entry C’s done. 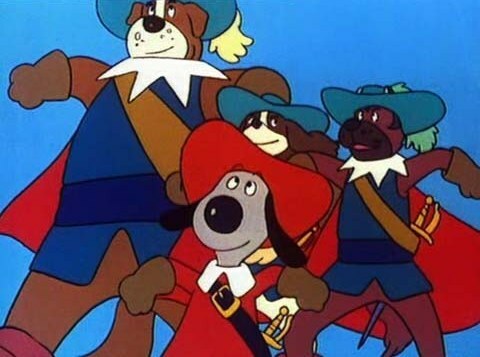 Unfortunately, the rest of the world knows that phrase as “All for one and one for all” and associates it with a cartoon dog so, er… Next! “O my Switzerland, I love you so much”, starts the chorus to entry F, making the singer sound somewhat like a stalker shouting through a letterbox. They’re quite a weird stalker as then they start shouting about “my country of freedom, ideal of equality, true cradle of peace on earth” but they’re Swiss, they might be into such things! The person behind Entry E deserves a lot of praise as they wrote an entirely new tune. It starts well enough too with a series of staccato phrases, as if mimicking a child skipping through some woods. Unfortunately, it then drops into a minor key as if the child’s skipped into a witch’s lair and is about to be murdered. But you can’t have everything can you? Entry D is an original tune too, and actually a very nice one until you start picturing a drunk uncle singing it at Christmas while winking at your mother, and that just isn’t right! “White cross on a red background,” opens Entry A before apparently deciding the best approach to writing an anthem is to just list every one of Switzerland’s values in a hope no one could possibility criticise it. “Freedom, independence, peace, open to the world in which we live,” it goes. I’d prefer something more emotional and less like a shopping list, but it’s certainly the most Swiss entry, which gives me a horrid feeling it might win. For those who know a thing or two about national anthems, you may be wondering where the references to landscape are, well here they come, all two of them! “From the tops of our peaks to the heart of our cities,” this one goes, before proclaiming the singer’s love for this beautiful land. They may not be the most original words, but they are certainly the most traditionally anthemic. If I was going to go out on a limb, I’d say this entry – B – is the winner, but don’t be boring, Switzerland, go for the drunk uncle one! Hate Ukraine? Then write Donetsk’s national anthem! 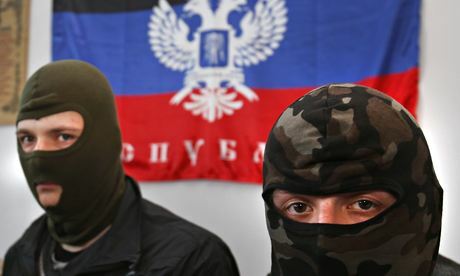 This is Sergei Grits/AP’s photo of some masked activists in the Donetsk People’s Republic. Apologies for stealing it, but it’s really good and I’m not there to take my own! What do you do if you’ve blown up a plane and need some good publicity? If you’re the Donetsk People’s Republic you, er, launch a contest for a national anthem. God knows what the rebels hope getting an anthem will achieve, but the call’s serious: anyone who wants to submit words has until midnight Wednesday to do so. Just email legstutis@mail.ru with your entry. Given the fighting’s intensifying around the city, I’m not sure the republic will last until Wednesday, but still, I imagine there’s a lot of Dutch people who will want to enter. I have contacted the republic’s government to ask why they’re doing this, why they’ve only given a few days for entries, and why they’re not just using Russia’s anthem since they want to become part of that country, but they haven’t got back to me. I’ll update this if they ever do. I did also try calling their “hotline for complaints about cases of armed looting and possible terrorist acts and provocations”, but no one picked up. Probably for the best! As an aside, if you’re interested in a) what’s happening in Ukraine, and b) music, I thoroughly recommend this Foreign Policy piece from last month about ”the Ukraine crisis as told through rap videos”. Fascinating, disturbing and bizarre, in that order. Update: The fighting’s got worse, and no anthem’s emerged. It’s not going to happen is it? I know I’ve banged on about Switzerland’s search for a new anthem for what seems like eternity, but what’s one more story between friends? Here’s a piece I just recorded for the BBC’s amazing From Our Own Correspondent programme. If you don’t want to click that link for my dulcet tones alone, there’s also a brilliant piece in that episode by the BBC’s North American correspondent Rajini Vaidyanathan about her visit to the hamlet of Hell, Michigan. 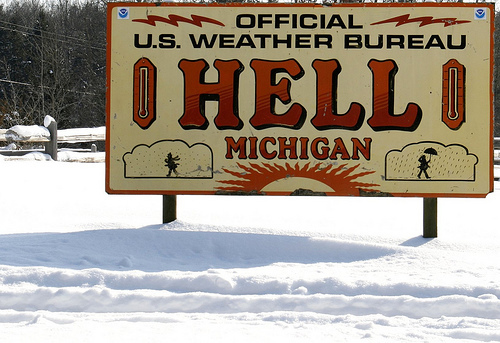 Yes, Hell has literally frozen over!